I am not the biggest on ceremony when it comes to Oracle Cards. I do not set up Candles and lay out silk to place the cards. I do not even go to a table. I do not have a table in my room. Just a Lazy-Boy Chair that is really old. It doesn’t look old, but it was from a garage sale while I was in college. It has followed me from apartment to apartment. Then I have my bed, and chest of drawers. Because my bedroom seems like the best place to seat uninterrupted, I just lay the cards out on my bed. 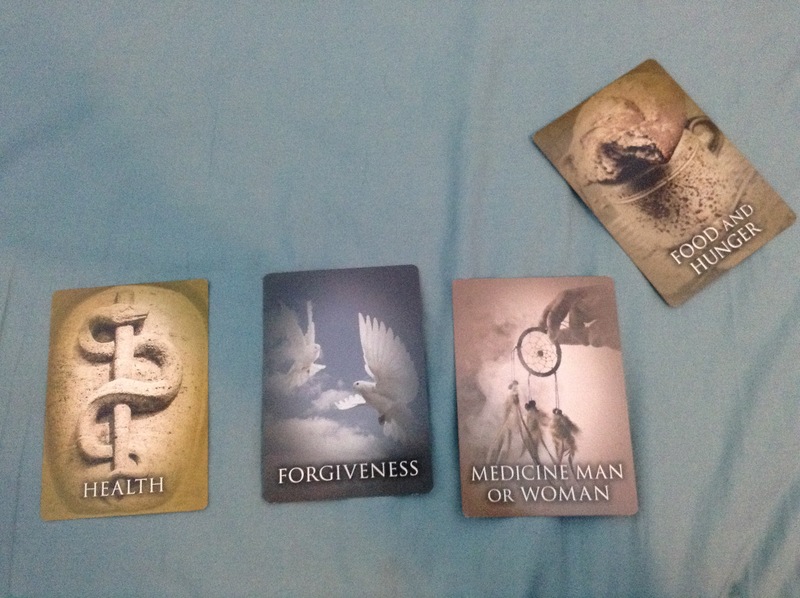 Yesterday I used Doreen Virtues Past Life Oracle Cards. 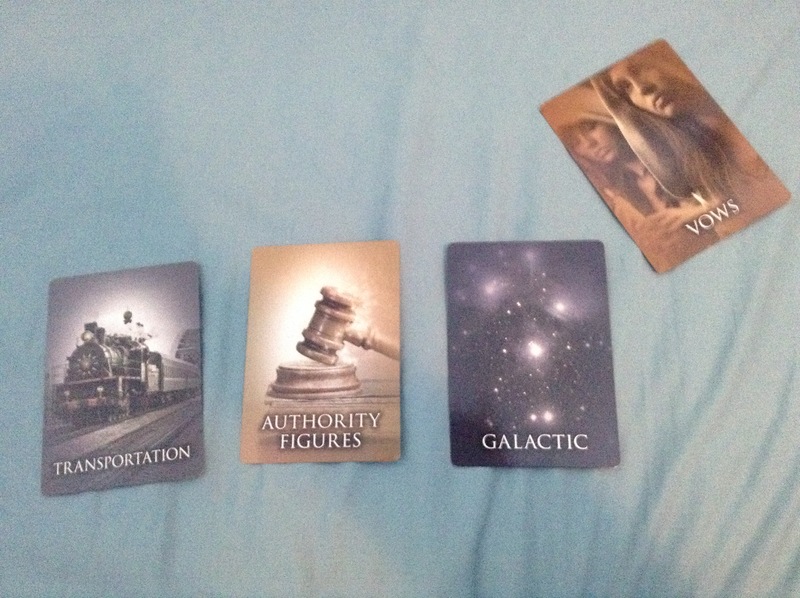 My first reading was a three card reading. I asked which Life would be the most Important for me to remember at this moment. Present card: Today, having been misdiagnosed with Bipolar Type I with Psychosis, I have an understanding of Bipolar disorder. I need to forgive all the blame I put on myself when I was an Alcoholic in a past life. I also need to Forgive the Health System for mishandling my case, and for being imperfectly 17 years behind the research. This is the way of the system. New information takes time to be implemented, and the drug companies are brain washing the Doctors. This will change, and, I have a feeling that with today’s speed, it will not take 17 years. Future Card: A while ago I used a Past Life Regression CD, and went to a lifetime as a Medicine Man. I was respected, but felt alone. People looked up to me, and they talked to me as a superior. I didn’t like this. One day while gathering herbs in the woods, I was attacked by a bear, and died. Even through this is a Past Life. It is in the Future position. I have the potential to become a Healer in this life. I understand the limits of the Health System, but also that it needs to be respected. It is not a perfect system, but I don’t believe Doctors are as bad as some paint them out to be. I think given the chance a majority of Doctors would cure an illness knowing that it isn’t as profitable. I think that Doctors who falsely diagnose Cancer to make money are rare. It is by having an Hypothyroidism that I have discovered that, while the Health System is good in many ways, it is 17 years behind. I understand that it overlooks many supplements, but take hope in that it has discovered Fish Oil. If I were to be a Healer, I am not drawn to tell people what supplements to take, or what to eat. I would not be a Healer of Individuals. I would use my Power of Prayer/Manifestation to Heal the Health System. I will reach more people Praying for the Health System, then being a Medicine Women in this life. I have been in the Health System for many years, so know personally it needs Healing. Still, I will warn you to research any supplement you take, and get them from credible sources. They are unregulated, and can do damage to your health if you either choose the wrong supplement, or the wrong provider. This also goes back to the Forgiveness card. A few days ago, a Doctor who has seen supplements do damage to the liver told me to stop all supplements excluding vitamins from a drug store. The thing is, my liver enzymes only go up when I run out of Turmeric. I have had good liver enzymes while taking my supplements, but when I stop the supplements they go up. They might not know what is wrong with my liver, but supplements appear to take care of the problem. The Doctor right before her had told me that the supplements I was taking had studies showing they helped the liver, and they were fine with the ones I was on. The Doctor telling me to stop all supplements was doing so because they had seen people who had taken the wrong supplements and done damage to the liver. This serves as a warning to me to continue to research my supplements. After hearing this, I was grumpy. I tried to hide it from the Doctor, but I left that hospital in such a bad mood. It was like the concept of a Doctor asking me to stop all supplements opened me up to the negativity inside the hospital. When I got home I was so angry. Luckily I as home alone, because I was putting the silverware away by throwing them into place. Just to make sound, and get out the frustration. I am a little more confused by this one.